In vivo studies have shown that regulatory CD4+ T cells regulate conventional CD4+ T cell responses to self- and environmental Ags. However, it remains unclear whether regulatory CD4+ T cells control CD8+ T cell responses to self, directly, or indirectly by decreasing available CD4+ T cell help. We have developed an experimental mouse model in which suppressive and helper T cells cannot mediate their functions. The mouse chimeras generated were not viable and rapidly developed multiple organ autoimmunity. These features were correlated with strong CD8+ T cell activation and accumulation in both lymphoid and nonlymphoid organs. 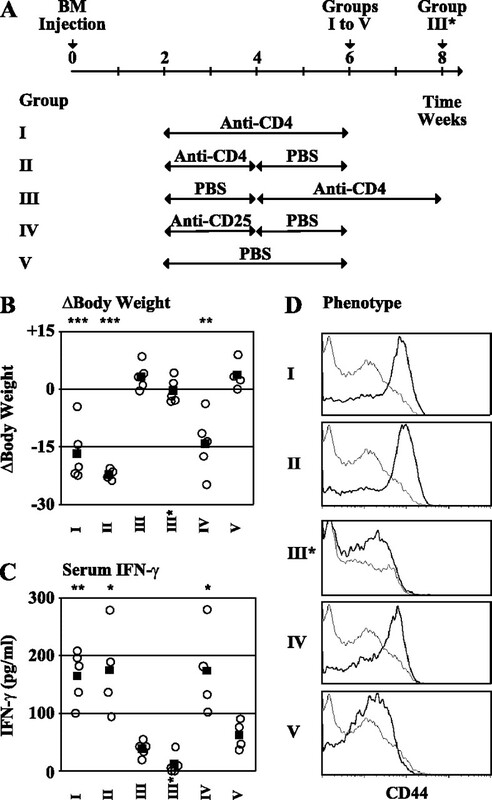 In vivo Ab treatment and secondary transfer experiments demonstrated that regulatory CD4+ T cells play an important direct role in the prevention of peripheral CD8+ T cell-mediated autoimmunity. Naturally occurring regulatory CD4+ T cells originate in the thymus and migrate to the periphery, where they control T cell responses to self-Ags (1). They prevent various autoimmune and inflammatory disorders, including inflammatory bowel disease, gastritis, type 1 diabetes, orchitis, oophoritis, and thyroiditis (2, 3, 4). Regulatory CD4+ T cells account for ∼10% of peripheral CD4+ T cells and most of them express CD25. They all have an activated phenotype, with the down-regulation of CD45RB and stronger expression of CTLA-4, GITR, and LFA-1 than the bulk of conventional CD4+ T cells (5). The expression of Foxp3, a transcription factor playing a critical role in the development and function of regulatory CD4+ T cells, is mainly restricted to these cells (6, 7, 8, 9). Following TCR cross-linking in vitro, regulatory CD4+ T cells inhibit IL-2 production and the subsequent proliferation of both conventional CD4+ and CD8+ responder T cells via a cell contact-dependent, cytokine-independent mechanism (10, 11, 12, 13). In vivo, regulatory CD4+ T cells control CD4+ T cell responses to self- and environmental Ags. The injection of naive CD4+ T cells alone into lymphopenic recipients leads to the development of inflammatory and autoimmune diseases resembling those observed in animals after thymectomy on day 3 after birth (14, 15, 16). In both these models, the transfer of regulatory CD4+ T cells prevents disease (15, 17, 18, 19). Mutations in the Foxp3 gene in humans and mice lead to the development of an autoimmune polyendocrinopathy, due to a lack of regulatory CD4+ T cell generation (20, 21, 22). Autoreactive CD4+ T lymphocytes have been implicated as the main mediators of this disease in mice (23, 24). However, it remains unclear whether regulatory CD4+ T cells directly control CD8+ T cell responses to self. Ensuring conventional CD4+ T cell tolerance may be enough to regulate CD8+ T cells responding to self-Ags. According to this model, regulatory CD4+ T cells regulate CD8+ T cell responses indirectly by decreasing the available CD4+ T cell help. Consistent with this model, mice lacking MHC class II molecules, and therefore also lacking both regulatory and helper CD4+ T cells, do not develop autoimmune syndromes (25). The CD8+ T cells of these mice also show no signs of activation (26). Thus, regulatory CD4+ T cells do not seem to be directly involved in establishing and/or maintaining peripheral CD8+ T cell tolerance to self. Recent results challenge this model. First, several groups have reported helper CD4+ T cells to be required for the generation and/or survival of fully functional memory CD8+ T cells but not for primary CD8+ T cell responses (27, 28, 29). Thus, regulating CD4+ T cell help would not be sufficient to suppress primary CD8+ T cell responses to self-Ags, and most autoimmune diseases probably do not require recall stimulation. Second, we have recently characterized CD8+ T lymphocytes constitutively expressing CD25 and Foxp3 that inhibit T cell responses with an efficiency similar to that of regulatory CD4+CD25+Foxp3+ T cells, in mice lacking MHC class II molecules (26). Thus, naturally occurring CD8+CD25+Foxp3+ T cells may account for the regulation of CD8+ T cell autoreactivity against tissue-specific auto-Ags in MHC class II molecule-deficient mice (26, 30). To test whether regulatory CD4+ T cells play a direct role in the establishment and/or maintenance of peripheral CD8+ T cell tolerance in normal mice, we have developed an experimental mouse model in which both suppressive and helper T cells are unable to mediate their functions. The mouse chimeras generated died rapidly and had mononuclear cell infiltrates in various organs. These features were correlated with the strong activation and accumulation of peripheral CD8+ T cells. In vivo Ab treatment and secondary transfer experiments demonstrated that a lack of functional regulatory T cells, even in the absence of CD4+ T cell help, led to the breakdown of peripheral CD8+ T cell tolerance. C57BL/6 mice were obtained from Centre d’élevage Janvier and C57BL/6 CD3ε−/− mice (31) were obtained from the Centre de Développement des Techniques Avancées pour l’Expérimentation Animale. MHC IIΔ/Δ mice (IIKO mice; Ref. 25) were originally purchased from The Jackson Laboratory and then maintained in our own animal facilities (Hôpital Saint-Vincent-de–Paul, Paris, France). C57BL/6 CD3ε−/− mice were crossed with MHC IIΔ/Δ mice to obtain CD3ε/MHC II double-deficient mice (CD3ε−/− IIKO mice; Ref. 32). MHC IIΔ/Δ mice (CD45.2) were crossed with C57BL/6 CD45.1 mice to obtain MHC IIΔ/Δ CD45.1 mice. Experiments were conducted on 4- to 10-wk-old mice. Experiments were done in accordance to the guidelines of the French Veterinary Department. Mice were injected i.p. three times per week with 100 μg of anti-CD4 (GK1.5), anti-CD8α (53-6.7) or anti-CD25 (PC61) Ab purified from hybridoma supernatants. Thymus, lymph nodes, and spleen were homogenized on a nylon cell strainer (BD Falcon) in RPMI 1640 Glutamax (Invitrogen) supplemented with 10% FCS (BIOCHROM AG) for adoptive transfer and culture assay or in PBS, 5% FCS, 0.1% NaN3 (Sigma-Aldrich) for flow cytometry. Bone marrow (BM)3 cells were obtained by flushing femur and tibia bones with ice-cold recovery medium. Colon intraepithelial lymphocytes (IELs) were isolated as previously described (33). Briefly, the gut was flushed with PBS, opened, and the mucosa was scraped with a scalpel and the cells dissociated by stirring in 50 ml of RPMI 1640 Glutamax, 10% FCS. IELs were further purified on a Ficoll-Paque Plus gradient (Amersham Biosciences). Peritoneal cell suspensions were collected by washing the peritoneal cavity with PBS. BM cells were incubated on ice for 20 min with anti-CD4 (GK1.5) and anti-CD8α (53-6.7) Abs, obtained from hybridoma supernatants, and then with magnetic beads coupled to anti-rat Ig (Dynal Biotech). We injected 5 × 106 T cell-depleted BM cells i.v. into each mouse. Lymph node cells were incubated on ice for 20 min with anti-CD4 (GK1.5), anti-CD11b (Mac-1), anti-GR1 (8C5), and anti-CD19 (1D3) Abs, obtained from hybridoma supernatants, and then with magnetic beads coupled to anti-rat Ig (Dynal Biotech). Purified T cell subsets were usually 90–95% pure. We injected 2 to 3 × 106 purified CD8+ T cells i.v. into each mouse. CD3ε−/− IIKO mice subjected to lethal irradiation and immune reconstitution 2 wk before CD8+ T cell transfer were used as secondary hosts. Lymph node cells were incubated on ice for 20 min with anti-CD8 (53-6.7), anti-CD11b (Mac-1), anti-GR1 (8C5), and anti-CD19 (1D3) Abs, obtained from hybridoma supernatants, and then with magnetic beads coupled to anti-rat Ig (Dynal Biotech). Purified CD4+ T cells were labeled with biotinylated anti-CD25 (clone PC61) Ab. CD25+ T cells were then positively selected using MACS streptavidin microbeads (Miltenyi Biotec). CD4+CD25− cells purified from C57BL/6 CD45.2 control mice were labeled with CFSE (Molecular Probes). CD4+CD25− (50 × 104) CFSE-labeled cells were then cultured alone or together with 12.5 × 104 CD4+CD25+ cells purified from CD45.1 B6-B6 or IIKO-B6 chimeras, in the presence of soluble anti-CD3 Abs (0.2 μg/ml) and APCs (25 × 104 irradiated splenocytes from CD3ε−/− IIKO mice). Cells were recovered 3 days after the beginning of culture, stained, and analyzed by flow cytometry. Cell suspensions were collected and distributed in 96-well round-bottom microtiter plates (Greiner) (6 × 106 cell/well). Staining was performed on ice, for 15 min per step, in PBS, 5% FCS, and 0.1% NaN3 (Sigma-Aldrich). Peridin chlorophyll protein-conjugated anti-CD4 (RM4–5), FITC-conjugated anti-CD8α (53-6.7), PE-conjugated anti-TCRβ (H57–597), biotinylated anti-CD25 (7D4), anti-CD44 (1M781), and anti-CD69 (H1.2F3) Abs, and allophycocyanin-conjugated streptavidin were obtained from BD Biosciences. PE-conjugated anti-CD45.2 (104) Abs were obtained from eBioscience. Biotinylated anti-CD8β (H35–172), anti-TCRβ (H57–597) and anti-CD25 (PC61) Abs were purified from hybridoma supernatants. Intranuclear Foxp3 staining was performed using the PE-coupled anti-Foxp3 intracellular staining kit (eBioscience). Four-color immunofluorescence was analyzed with a FACSCalibur flow cytometer (BD Biosciences). List-mode data files were analyzed with Cell Quest software (BD Biosciences). Cells were stimulated by incubation for 4 h at 37°C in 5% CO2 in RPMI 1640 Glutamax, 10% FCS with 0.5 pg/ml PMA (Sigma-Aldrich), 5 pg/ml ionomycin (Sigma-Aldrich), in the presence of 10 pg/ml brefeldin A (Sigma-Aldrich), to block cytokine secretion (1 × 106 cells/ml). Samples were then incubated on ice for 15 min with anti-FcγRII/III (24G2) Abs obtained from hybridoma supernatants, stained for surface expression of CD4, CD8α, and TCRβ, fixed in 2% paraformaldehyde and permeabilized by incubation with 0.5% saponin. Intracellular staining was conducted by incubation for 30 min with PE-conjugated anti-IL-2 (JES6-5H4) or anti-IFN-γ (XMG1.2) Ab (BD Biosciences). Anti-IFN-γ (R46A2) Abs were used as a capture reagent and biotinylated anti-IFN-γ (AN18) Abs were used for detection, both purified from hybridoma supernatants. ELISA results were quantified with recombinant IFN-γ (R&D Systems). Paraffin-embedded sections: Organs were fixed in 8.6% formaldehyde (PROLABO) and 4.8% acetic acid (PROLABO) in distilled water. They were then embedded in paraffin and 3-μm sections were cut and stained with H&E. Frozen sections: Organs were frozen at −60°C in tissue freezing medium (Jung; Leica Microsystems). Sections (6 μm) were cut on a Leica cryostat and allowed to dry in air for 2 h before being fixed by incubation for 10 min in acetone at 4°C (PROLABO). Fixed sections were incubated in a wet chamber in 2% BSA fraction V (Sigma-Aldrich) in PBS for 20 min alone, 1 h with 1 μg/ml anti-CD4 (RM4–5) or anti-CD8α (53-6.7) or 2.5 μg/ml anti-CD19 (1D3) Abs (BD Biosciences), 30 min with 2.5 μg/ml biotinylated anti-rat Ig (Vector Laboratories), and 20 min with 5.9 μg/ml indocarbocyanin-conjugated streptavidin (Jackson ImmunoResearch Laboratories). Slides were finally mounted in Vectashield with DAPI (4′,6-diamidino-2-phenylindole; Vector Laboratories). Data are expressed as mean ± SEM, and the significance of differences between two series of results was assessed using Student’s unpaired t test. Values of p < 0.05 were considered significant. We assessed the role of regulatory Foxp3+ T cells in CD8+ T cell peripheral tolerance, using an experimental model in which suppressive T cells were unable to mediate their suppressive functions. In this model, BM cells from mice with and without MHC class II molecule expression were injected i.v. into lethally irradiated recipients devoid of T cells (Fig. 1⇓A). When MHC class II-expressing BM cells were injected into the recipient, the resulting chimeras (B6-B6 chimeras) displayed a pattern of MHC class II molecule expression similar to that of control C57BL/6 mice. We therefore expected these chimeras to behave like C57BL/6 mice following reconstitution of their peripheral T cell compartment. 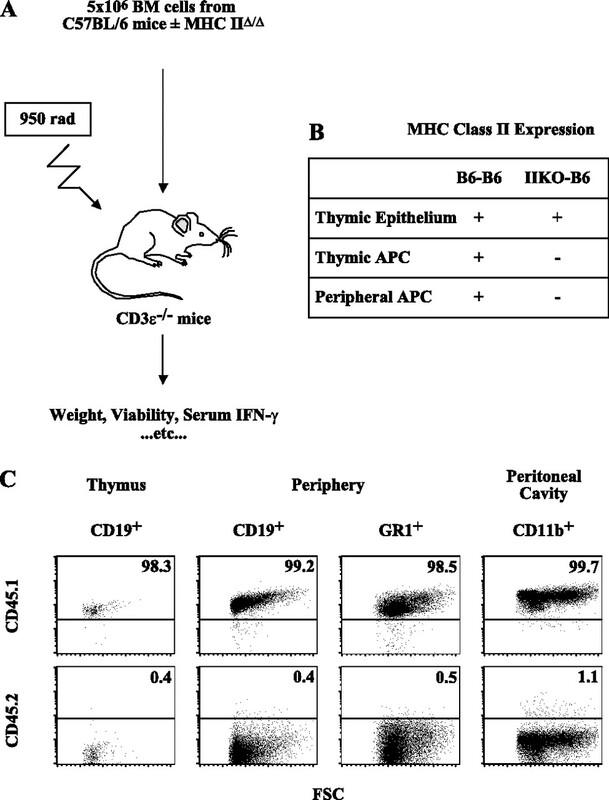 In chimeras generated by injecting BM cells that did not express MHC class II molecules into recipients (IIKO-B6 chimeras), MHC class II molecule expression was mostly restricted to radio-resistant thymic epithelial cells (Fig. 1⇓B). In these chimeras, CD4+ T cells, and regulatory CD4+ Foxp3+ T cells in particular, were produced in the thymus more efficiently than in B6-B6 chimeras, due to the lack of efficient thymic negative selection by BM-derived APCs in the thymic medulla (Fig. 2⇓; Ref. 34). Nevertheless, the lack of MHC class II molecule expression at the surface of professional APC in the periphery (Fig. 1⇓C) suggested that regulatory CD4+ T cell activation in response to self-Ags in the periphery would be unlikely. As regulatory T cells must be activated to mediate their suppressive functions (35), we expected peripheral regulatory CD4+Foxp3+ T cells to be nonfunctional in IIKO-B6 chimeras. Experimental model. A, Diagram illustrating the experimental model. B, Table summarizes the surface expression of MHC class II molecules on thymic epithelium and thymic or peripheral BM-derived APCs in chimeras. C, C57BL/6 CD45.2 CD3ε−/− mice were lethally irradiated and their immune system reconstituted with IIKO CD45.1 mouse (IIKO-B6 chimeras) BM cells. Chimeras were killed 28 days after BM cell transfer. CD45.1/FSC and CD45.2/FSC dot plots are shown for thymic CD19+ cells, peripheral CD19+ cells, peripheral GR1+ cells, and CD11b+ cells from the peritoneal cavity. The dot plots were generated from the data for one mouse but are representative of two individual experiments with at least three mice per group. Numbers in quadrants indicate the frequency of subpopulations. IIKO-B6 chimeras lack functional Foxp3+ regulatory T cells. C57BL/6 CD3ε−/− mice were lethally irradiated, and their immune system reconstituted with C57BL/6 mouse (B6-B6 chimeras) or IIKO mouse (IIKO-B6 chimeras) BM cells. Chimeras were killed 28 days after BM cell transfer. The thymus and pooled lymph nodes and spleen (periphery) were recovered and used to prepare single-cell suspensions. A, CD4/CD8α dot plots of thymuses of chimeras and 6- to 8-wk-old C57BL/6 and IIKO control mice are shown. B, Foxp3/FSC dot plots are shown for thymic CD4+CD8α− TCRβhigh (CD4SP) and CD4−CD8α+ TCRβhigh (CD8SP) cells. The dot plots were generated from the data for one mouse per group but are representative of two individual experiments with at least three mice per group. Numbers in quadrants indicate the frequency of subpopulations. C, Absolute numbers of CD4+CD8α− TCRβhigh and CD4−CD8α+ TCRβhigh cells expressing Foxp3 in the thymus and the periphery were calculated. Data are mean ± SEM values for at least six mice in each group. D, CD4SP CD25+ cells were purified from lymph nodes of CD45.1 chimeras and CD4SP CD25− cells from lymph nodes of C57BL/6 control mice (CD45.2). CD4SP CD25− cells were labeled with CFSE and cultured alone or together with the indicated CD4SP CD25+ cells at a 4:1 ratio, in the presence of soluble anti-CD3 and APCs. CFSE fluorescence histograms of the CD4SP CD45.2+ cells are shown 3 days after the beginning of culture (bold lines). CFSE fluorescence histograms in the absence of anti-CD3 stimulation are shown as controls (thin lines). Results are representative of four independent experiments. E, Foxp3/CD25 dot plots are shown for lymph node CD4+CD8α− (CD4SP) cells from IIKO-B6 and B6-B6 chimeras 28 days after BM cell transfer. The dot plots were generated from the data for one mouse per group but are representative of two individual experiments with at least three mice per group. Numbers in quadrants indicate the frequency of subpopulations. To verify this assumption, we then studied the capacity of regulatory CD4+ T cells from IIKO-B6 and B6-B6 chimeras to inhibit the response of conventional CD4+ T cells (CD4+CD25− T cells from C57BL/6 control mice) to anti-CD3 stimulation in vitro (Fig. 2⇑D). CD4+CD25+ T cells from B6-B6 chimeras inhibited the proliferation of conventional CD4+ T cells (Fig. 2⇑D) as efficiently as regulatory CD4+ T cells from C57BL/6 control mice (data not shown). By contrast and in agreement with our hypothesis, regulatory CD4+ T cells from IIKO-B6 chimeras failed to suppress the proliferative response of conventional CD4+ T cells to anti-CD3 stimulation. The inefficiency of regulatory CD4+ T cells from IIKO-B6 chimeras to mediate their suppressive functions did not result from a stronger contamination of CD4+CD25+ T cells by activated conventional CD4+ T cells in IIKO-B6 chimeras than in B6-B6 chimeras. Indeed, the proportion of CD4+CD25+ T cells coexpressing Foxp3 was similar in IIKO-B6 and B6-B6 chimeras (Fig. 2⇑E). We have recently described a subset of CD8+ T cells expressing CD25 and Foxp3 and displaying regulatory activities in both the thymus and periphery of mice lacking MHC class II molecule expression (26). The percentage and the absolute number of CD8+ T cells expressing Foxp3 was not higher in IIKO-B6 chimeras than in B6-B6 chimeras or control C57BL/6 mice (Fig. 2⇑, B and C), indicating that regulatory CD8+Foxp3+ T cell generation requires thymic epithelial cells to have no MHC class II molecule expression. Thus, the percentage of CD8+ T cells expressing Foxp3 was no higher in IIKO-B6 chimeras than in control C57BL/6 mice, and although regulatory CD4+ Foxp3+ T cells were produced in the thymus, these cells were inefficient in terms of their suppressive function in the periphery. We can therefore conclude that IIKO-B6 chimeras lack functional Foxp3+ regulatory T cells in the periphery. We studied the fate of these mouse chimeras as a function of time after BM cell transfer. IIKO-B6 chimeras were not viable. They began to die as early as the 6th week post-BM cell transfer, and all had died within 12 wk (Fig. 3⇓A). This nonviability of the IIKO-B6 chimeras was correlated with substantial weight loss during the 6th week post-BM cell transfer (Fig. 3⇓B) and with the presence of large amounts of IFN-γ (Fig. 3⇓C) and TNF-α (data not shown) in the serum 40 days after BM cell transfer. B6-B6 chimeras, used as controls, showed no signs of sickness. Characterization of B6-B6 and IIKO-B6 chimeras. C57BL/6 CD3ε−/− mice were lethally irradiated and their immune system reconstituted with C57BL/6 mouse (B6-B6 chimeras) or IIKO mouse (IIKO-B6 chimeras) BM cells. A, Chimera survival was plotted up to 20 wk after BM cell transfer (n = 15 mice per group). B, Changes in the body weight of chimeras between days 33 and 40 after BM cell transfer, calculated as follows: (weight (day 40) − weight (day 33))/weight (day 33). C, Serum IFN-γ levels in the chimeras were determined by ELISA 40 days after BM cell transfer. Each circle represents a mouse and black squares represent mean values (***, p < 0.001; B and C). Chimeras were killed from the 40th day after BM cell transfer and paraffin-embedded sections of various organs were stained with H&E. D, The table records the presence of mononuclear cell infiltrates in the indicated organs. Results are expressed as the number of infiltrated organs over the number of organs examined. E, Tissue sections from the stomach and pancreas of a chimera 8 wk after BM cell transfer are shown. Original magnifications are ×10 for the upper panel and ×20 for the lower panels. Histological examination revealed the presence of mononuclear cell infiltrates in several of the organs examined (summarized in Fig. 3⇑D). All tested colon and liver samples and most stomach, pancreas and thyroid samples from IIKO-B6 chimeras contained leukocyte infiltrates 6 wk after BM cell transfer. By contrast, all the tested organs of B6-B6 chimeras remained leukocyte-free at all time points after BM cell transfer. Cell infiltrates become more extensive over time in the pancreas and stomach of IIKO-B6 chimeras, resulting in the disorganization (Fig. 3⇑E) and dysfunction of these organs. Only the exocrine pancreas (i.e., not the islets of Langerhans) was infiltrated (Fig. 3⇑E). Thus, IIKO-B6 chimeras rapidly develop pathological features similar to the general/multiple organ autoimmunity typical of humans or mice lacking regulatory CD25+ T cells (immune dysregulatory, polyendocrinopathy, enteropathy, X-linked (IPEX) humans; scurfy mice). In IPEX humans and scurfy mice, autoimmunity results from the uncontrolled production of peripheral effector T cells with self-specificity (23, 24). We investigated whether the symptoms developed by IIKO-B6 chimeras also reflected uncontrolled T cell reactivity against self-Ags, by studying the absolute numbers and activation of T cells during reconstitution of the peripheral T cell pool in both groups of chimeras. In BM chimeras, mature lymphocytes first began to migrate from the thymus to the periphery 2 wk after BM cell transfer (data not shown). Two weeks later, the peripheral T cell compartments of B6-B6 and IIKO-B6 chimeras were similar, both containing more CD4+ T cells than CD8+ T cells, in terms of both percentages (Fig. 4⇓A) and absolute numbers (Fig. 5⇓B). However, IIKO-B6 chimeras produced more CD4 single-positive thymocytes (Fig. 4⇓A), reflecting a lack of efficient negative selection of MHC class II-restricted cells in these mice, as suggested by Van-Meerjwick et al. (34). No significant difference is observed between IIKO-B6 and B6-B6 chimera T cells 28 days after BM cell transfer. C57BL/6 CD3ε−/− mice were lethally irradiated and their immune system reconstituted with C57BL/6 mouse (B6-B6 chimeras) or IIKO mouse (IIKO-B6 chimeras) BM cells. Chimeras were killed 28 days after BM cell transfer, and thymus, lymph nodes, spleen, and BM were recovered and used to prepare single-cell suspensions (with pooling of the lymph nodes and spleen (periphery)). A, CD4/CD8α dot plots of chimeras and C57BL/6 and IIKO control mice are shown. The dot plots were generated from the data for one mouse per group but are representative of two individual experiments with at least three mice per group. Numbers in quadrants indicate the frequency of subpopulations. 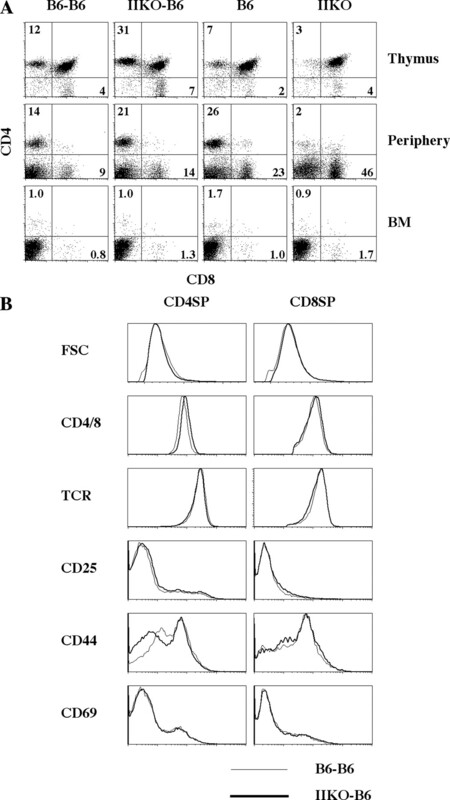 B, Cell size (FSC) and CD4 or CD8α, TCRβ, CD25, CD44, and CD69 fluorescence histograms of CD4+CD8α− TCRβhigh (CD4SP) and CD4−CD8α+ TCRβhigh (CD8SP) cells are shown for B6-B6 (plain line) and IIKO-B6 (bold line) chimeras. The histograms were generated with the data for one mouse but are representative of two individual experiments with at least three mice per group. CD8+ T cells accumulate in the periphery of IIKO-B6 chimeras. C57BL/6 CD3ε−/− mice were lethally irradiated and their immune system reconstituted with C57BL/6 mouse (B6-B6 chimeras) or IIKO mouse (IIKO-B6 chimeras) BM cells. Chimeras were killed 40 days after BM cell transfer, and thymus, lymph nodes, spleen, and BM were recovered and used to prepare single-cell suspensions (with pooling of the lymph nodes and spleen (periphery)). A, CD4/CD8α dot plots of chimeras and of 6- to 8-wk-old C57BL/6 and IIKO control mice are shown. The dot plots were generated for one mouse per group but are representative of five individual experiments with at least three mice per group. Numbers in quadrants indicate the frequency of subpopulations. B, Absolute numbers of CD4+CD8α− TCRβhigh (CD4SP) and CD4−CD8α+ TCRβhigh (CD8SP) cells in the periphery were calculated for chimeras. Absolute numbers of CD4SP and CD8SP cells and the CD4SP/CD8SP ratio are shown as a function of time after BM cell transfer. Data are mean ± SEM values for at least three mice in each group and per time point. C, Cells were recovered from the BM and peritoneal cavity and IELs were recovered from the colon of chimeras and control C57BL/6 mice and the CD4SP/CS8SP ratio was calculated. Data are mean ± SEM values for at least three mice per group. For IELs, analysis was restricted to CD8 α- and β-chain expressing cells. D, Immunohistofluorescence characterization of the lymphocytes infiltrating the stomach and pancreas of IIKO-B6 chimeras 8 wk after BM cell transfer (×100). Six weeks after BM cell transfer, the thymuses of IIKO-B6 chimeras contained <5 × 106 cells (B6-B6 thymuses contained ∼100 × 106 cells at the same time point) and almost no immature double-positive thymocytes (Fig. 5⇑A). This almost certainly reflects the stress-induced apoptosis of immature thymocytes, because the disruption of thymic development was correlated with the occurrence of pathological symptoms in IIKO-B6 chimeras. The percentage and absolute number of CD4+ T cells in the periphery were similar in both groups of chimeras, whereas the percentage and absolute number of CD8+ T cells were higher in IIKO-B6 chimeras than in B6-B6 chimeras (Fig. 5⇑, A and B). The rapid increase in the number of peripheral CD8+ T cells over time in IIKO-B6 chimeras led to a decrease in the CD4/CD8 ratio resulting in there being more CD8+ than CD4+ peripheral T lymphocytes in these chimeras 5 wk after BM cell transfer (Fig. 5⇑B). CD8+ T cells also accumulated in the BM of IIKO-B6 chimeras (Fig. 5⇑, A and C). This accumulation was associated with the complete abolition of B cell differentiation (Fig. 6⇓). The CD4/CD8 ratio was found to have decreased in leukocytes isolated from the peritoneal cavity and IELs isolated from the colon of IIKO-B6 chimeras (Fig. 5⇑C), suggesting that a large proportion of the leukocytes infiltrating the organs of IIKO-B6 chimeras were CD8+ T lymphocytes. This was confirmed by staining histological sections of various infiltrated organs of IIKO-B6 chimeras. Indeed, we detected large numbers of CD8+ T cells but only a few CD4+ T cells in the pancreas, the stomach, the colon, and the liver of IIKO-B6 chimeras, 8 wk after BM cell transfer. (Fig. 5⇑D and data not shown). 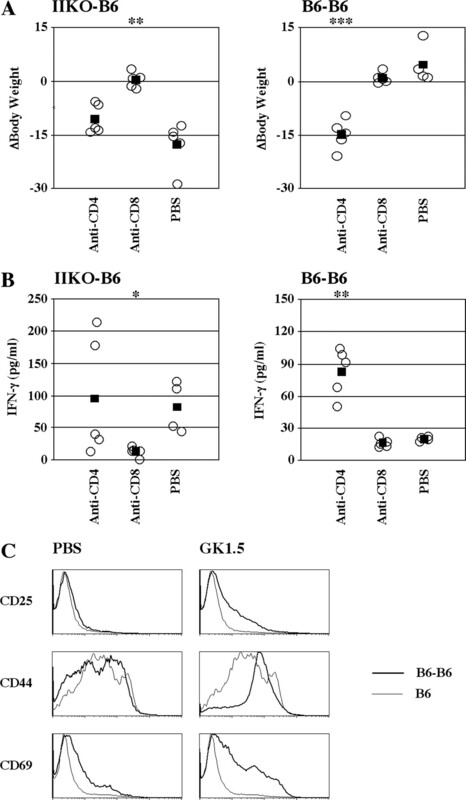 Abolition of B cell differentiation in IIKO-B6 chimeras. C57BL/6 CD3ε−/− mice were lethally irradiated and their immune system reconstituted with C57BL/6 mouse (B6-B6 chimeras) or IIKO mouse (IIKO-B6 chimeras) BM cells. Chimeras were killed 28 or 40 days after BM cell transfer; their BM was recovered and used to prepare single-cell suspensions. CD45R/IgM dot plots of 28 days (left column) or 40 days (right column) post-BM cell transfer chimeras and C57BL/6 and IIKO control mice are shown. The dot plots were generated with the data for one mouse per group but are representative of two individual experiments with at least three mice per group. Numbers in quadrants indicate the frequency of subpopulations. CD24 fluorescence histograms of CD45R+ IgM− cells are shown for 40 days post-BM cell transfer chimeras and control mice. The histograms were generated with the data for one mouse but are representative of two individual experiments with at least three mice per group. We assessed the expression of activation markers on peripheral CD4+ and CD8+ T lymphocytes as a function of time after BM cell transfer. Four weeks after BM cell transfer, no significant difference between IIKO-B6 and B6-B6 chimeras was observed for any of the surface markers tested on CD8+ cells (or CD4+ T cells) (Fig. 4⇑B). Six weeks after BM cell transfer, CD8+ T lymphocytes from IIKO-B6 chimeras displayed signs of activation, with CD44 up-regulation and an increase in the percentage of cells expressing CD25 and CD69 (Fig. 7⇓A). No such activation was observed in CD8+ T lymphocytes from B6-B6 chimeras. The proportion of blast cells among CD8+ T cells was also greater in IIKO-B6 than in B6-B6 chimeras. CD4+ T cells from IIKO-B6 chimeras displayed no signs of activation, and expressed CD44 less strongly than CD4+ T cells from B6-B6 chimeras. We can therefore exclude the possibility of a response of non-negatively selected CD4+ T cells against residual recipient-derived peripheral APC expressing MHC class II molecules in IIKO-B6 chimeras. Peripheral CD8+ T cells from IIKO-B6 chimeras have an activated phenotype and enhanced functional capacities. C57BL/6 CD3ε−/− mice were lethally irradiated and their immune system reconstituted with C57BL/6 mouse (B6-B6 chimeras) or IIKO mouse (IIKO-B6 chimeras) BM cells. Chimeras were killed 40 days after BM cell transfer, and lymph nodes and spleen were recovered, pooled, and used to prepare single-cell suspensions. A, Cell size (FSC) and CD4 or CD8α, TCRβ, CD25, CD44, and CD69 fluorescence histograms of CD4+CD8α− TCRβhigh (CD4SP) and CD4−CD8α+ TCRβhigh (CD8SP) cells are shown for B6-B6 (plain line) and IIKO-B6 (bold line) chimeras. The histograms shown were generated from the data for one mouse but are representative of three individual experiments with at least three mice per group. B and C, Recovered cells were cultured for 4 h in the presence of PMA, ionomycin, and brefeldin A. They were then stained for the surface expression of CD4, CD8α, and TCRβ and finally for cytoplasmic IL-2 and IFN-γ. Peripheral lymphocytes from C57BL/6 mice were used as controls. 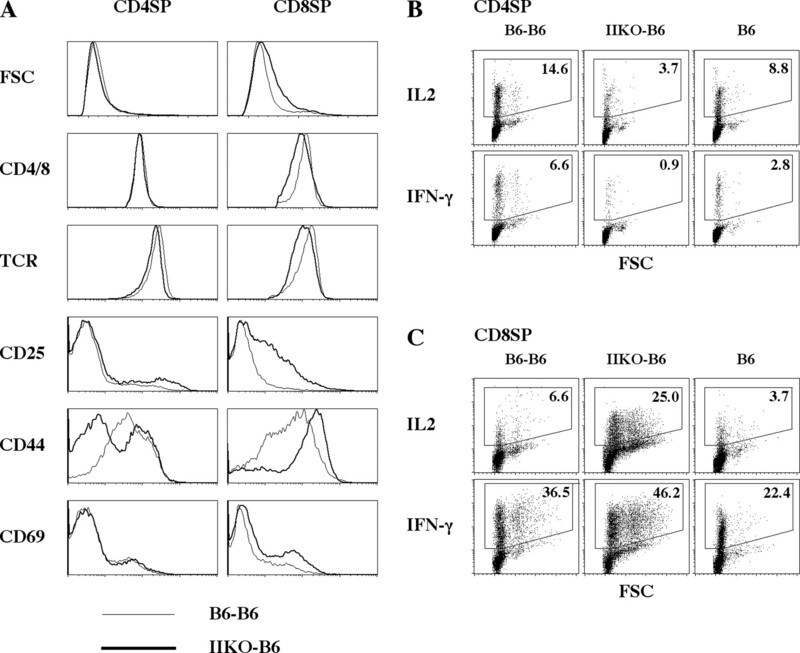 IL-2/FSC and IFN-γ/FSC dot plots are shown for peripheral CD4SP (B) and CD8SP (C) cells. Results are representative of two independent experiments with three mice per group. Numbers in gates indicate the frequency of subpopulations. We assessed the ability of peripheral T cells from both groups of chimeras to produce cytokines ex vivo (Fig. 7⇑, B and C). Consistent with their resting phenotype, CD4+ T cells from IIKO-B6 chimeras produced no more IL-2 or IFN-γ than CD4+ T cells from B6-B6 chimeras (Fig. 7⇑B). By contrast, CD8+ T cells from IIKO-B6 chimeras produced more IFN-γ and substantially more IL-2 than CD8+ T cells from B6-B6 chimeras or control C57BL/6 mice (Fig. 7⇑C). Thus, the pathological features of IIKO-B6 chimeras were correlated with an accumulation of activated CD8+ T cells in lymphoid and nonlymphoid organs. We purified CD8+ T cells from both groups of chimeras 4 wk after BM cell transfer and injected them into secondary recipient mice lacking T cells and MHC class II molecule expression, to determine whether CD8+ T cells were directly involved in the disease developed by IIKO-B6 chimeras (Fig. 8⇓). We chose to study the cells 4 wk after BM cell transfer because, at this time point, there was no significant difference in phenotype between the CD8+ T cells of IIKO-B6 chimeras and B6-B6 chimeras (Fig. 4⇑). We analyzed secondary hosts 8–10 wk after CD8+ T cell transfer. A larger number of CD8+ T cells were recovered from mice injected with CD8+ T cells from IIKO-B6 chimeras than from mice injected with CD8+ T cells from B6-B6 chimeras or control C57BL/6 mice (Fig. 8⇓A). Mice injected with CD8+ T cells from IIKO-B6 chimeras lost more weight and had higher serum IFN-γ levels than mice injected with CD8+ T cells from B6-B6 chimeras (Fig. 8⇓, B and C). 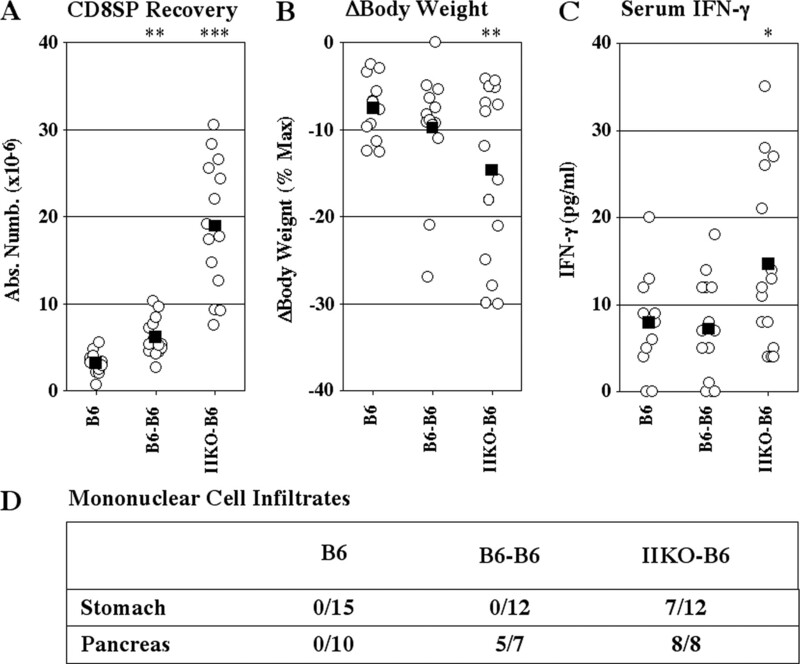 All mice injected with CD8+ T cells from IIKO-B6 chimeras developed mononuclear cell infiltrates in the exocrine pancreas and 60% of these mice developed such infiltrates in the stomach (Fig. 8⇓D). Seventy percent of recipient mice injected with CD8+ T cells from B6-B6 chimeras also developed mononuclear cell infiltrates in the pancreas. Nevertheless, these infiltrates were less severe than those observed in mice receiving CD8+ T cells from IIKO-B6 chimeras (data not shown). No infiltrates were observed if the CD8+ T cells were obtained from control C57BL/6 mice. The transfer of purified CD8+ T cells from IIKO-B6 chimeras was sufficient to reproduce the pathological symptoms of IIKO-B6 chimeras in the secondary recipient mice. Purified CD8+ T cells are sufficient to transfer the disease of IIKO-B6 chimeras. C57BL/6 CD3ε−/− mice were lethally irradiated and their immune system reconstituted with C57BL/6 mouse (B6-B6 chimeras) or IIKO mouse (IIKO-B6 chimeras) BM cells. Four weeks after BM cell transfer, lymph node CD8+ T cells from chimeras were purified and injected into CD3ε−/− IIKO secondary hosts. Purified lymph node CD8+ T cells from C57BL/6 mice were used as control cells. Secondary hosts were killed 8–10 wk after CD8+ T cell transfer and lymph nodes and spleen were recovered, pooled, and used to prepare single-cell suspensions. A, Absolute numbers of CD4−CD8α+ TCRβhigh cells recovered from secondary hosts are shown as a function of the origin of the injected cells. B, The body weight of secondary hosts at the time of death is presented as a percentage of maximum weight during the course of the experiment. C, Serum IFN-γ level of secondary hosts at the time of death was determined by ELISA. Each circle represents a mouse and black squares represent mean values. The significance of differences between chimeras and control C57BL/6 mice was assessed using Student’s unpaired t test. *, p < 0.05; **, p < 0.01; ***, p < 0.001 (A–C). D, Paraffin-embedded sections of various organs were stained with H&E. The table provides information about the presence of mononuclear cell infiltrates in the indicated organs. Results are expressed as the number of infiltrated organs over the number of organs examined. We treated IIKO-B6 chimeras with anti-CD4 or anti-CD8 Abs from the 14th day (the time point at which the first lymphocytes migrate from the thymus to the periphery) to the 40th day after BM cell transfer (Fig. 9⇓, A and B). We first checked that this treatment deleted the corresponding T cells without affecting thymic differentiation (data not shown). As expected, the peripheral deletion of CD4+ T lymphocytes did not lead to recovery. By contrast, IIKO-B6 chimeras treated with anti-CD8 Ab did not lose weight during the 6th week after BM cell transfer (Fig. 9⇓A), their serum IFN-γ levels remained low (Fig. 9⇓B), and no mononuclear cell infiltrates were observed in any of the organs tested (data not shown). CD8+ T cells play a direct role in the pathological condition of IIKO-B6 chimeras. C57BL/6 CD3ε−/− mice were lethally irradiated and their immune system reconstituted with C57BL/6 mouse (B6-B6 chimeras) or IIKO mouse (IIKO-B6 chimeras) BM cells. Two weeks after BM cell transfer, chimeras received three injections per week of 100 μg of anti-CD4 (GK1.5) Ab, anti-CD8α (53-6.7) Ab, or PBS. A, Changes in body weight of the chimeras between days 33 and 40 after BM cell transfer were calculated as follows: (weight (day 40) − weight (day 33))/weight (day 33). B, Serum IFN-γ levels of chimeras were determined by ELISA 40 days after BM cell transfer. Each circle represents a mouse and black squares represent mean values. The significance of differences between Ab-treated chimeras and PBS-treated chimeras was assessed using Student’s unpaired t test. *, p < 0.05; **, p < 0.01; ***, p < 0.001 (A and B). C, B6-B6 chimeras were killed 40 days after BM cell transfer, and lymph nodes and spleen were recovered, pooled, and used to prepare single-cell suspensions. 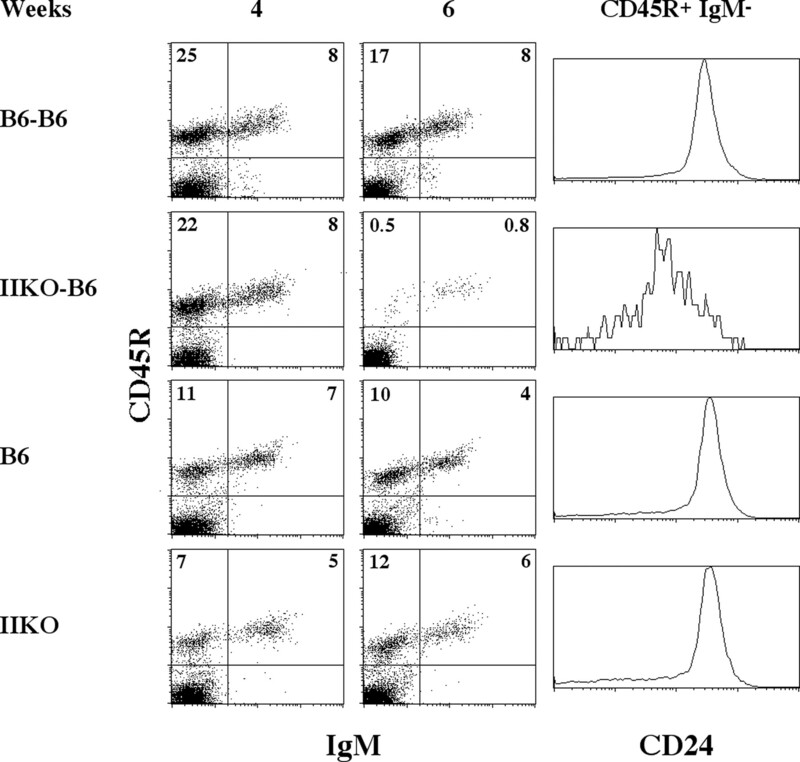 CD25, CD44, and CD69 fluorescence histograms of CD4−CD8α+ TCRβhigh cells from PBS- and anti-CD4 Ab-treated B6-B6 chimeras (bold line) are shown and compared with CD25, CD44, and CD69 fluorescence histograms for control peripheral CD8+ T cells from C57BL/6 mice (plain line). The histograms were generated using data from a single mouse but are representative of two individual experiments with five mice per group. Secondary transfer experiments showed that the transfer of CD8+ T cells alone was sufficient to transmit the disease developed by IIKO-B6 chimeras. Ab treatment showed that the elimination of peripheral CD8+ T cells abolished the pathological features of the chimeras. Thus, our results strongly suggest that the pathological features of IIKO-B6 chimeras result directly from the presence of nontolerant peripheral CD8+ T lymphocytes. This breakdown of peripheral CD8+ T cell tolerance was correlated with a lack of MHC class II molecule expression in the periphery in these mice and the expected resulting lack of functional regulatory CD4+Foxp3+ T cells. We investigated the role of regulatory CD4+ T cells in the establishment of peripheral CD8+ T cell tolerance, by treating B6-B6 chimeras with anti-CD4 or anti-CD8 Abs (Fig. 9⇑). When treated with anti-CD4 Ab, B6-B6 chimeras developed pathological symptoms similar to those of IIKO-B6 chimeras, such as substantial weight loss during the 6th wk post-BM cell transfer (Fig. 9⇑A), high serum IFN-γ levels (Fig. 9⇑B) and peripheral CD8+ T cell activation (Fig. 9⇑C) on day 40. Interactions between CD4+ T cells and MHC class II molecules are therefore essential for peripheral CD8+ T cell tolerance. Nevertheless, when injected into secondary recipients, CD8+ T cells from adult mice induced no marked pathological features (Fig. 8⇑), suggesting that CD4+ T lymphocytes play an important role in establishing, rather than maintaining CD8+ T cell tolerance. We investigated the timing of the requirement for CD4+/CD8+ T cell interactions in the establishment of peripheral CD8+ T cell tolerance, by treating B6-B6 chimeras with anti-CD4 Ab for various time periods during reconstitution of the peripheral T cell pool (Fig. 10⇓A). Mice treated from days 14 to 40 after BM cell transfer displayed all the symptoms of the disease developed by IIKO-B6 chimeras when analyzed on day 40 (Fig. 10⇓; group I). Similar results were obtained if treatment was restricted to the first 2 wk of peripheral T cell pool reconstruction (from day 14 to day 28; group II). Surprisingly, B6-B6 chimeras treated from day 28 to day 56 with anti-CD4 Ab (group III) developed none of the symptoms explored, even if analyzed 8 wk after BM cell transfer (i.e., after 4 wk of treatment; group III*). Thus, CD4+ T lymphocytes are required only during the first few weeks of peripheral T cell compartment reconstitution, for the establishment of CD8+ T cell tolerance. At later time points, the CD8+ T cells remained tolerant even if the CD4+ T cells were removed. The treatment of B6-B6 chimeras with anti-CD25 Ab (Fig. 10⇓; group IV) resulted in a phenotype similar to that obtained with the anti-CD4 treatment, strongly suggesting that regulatory CD25+ T cells are the CD4+ T cells required for the establishment of peripheral CD8+ T cell tolerance. A role for CD4+ T cells in the establishment of peripheral CD8+ T cell tolerance. C57BL/6 CD3ε−/− mice were lethally irradiated and their immune system reconstituted with C57BL/6 mouse BM cells (B6-B6 chimeras). Two weeks after BM cell transfer, chimeras received three injections per week of 100 μg of anti-CD4 Ab (GK1.5), anti-CD25 (PC61) Ab or PBS, for various periods of time. A, Diagram explaining Ab treatment. Most of the chimeras were killed 40 days after BM cell transfer; group III chimeras were not killed until 54 days after BM cell transfer. B, Changes in body weight of the chimeras between days 33 and 40 after BM cell transfer, calculated as follows: (weight (day 40) − weight (day 33))/weight (day 33). C, Serum IFN-γ levels of chimeras were determined by ELISA 40 days after BM cell transfer. As group III chimeras were killed 54 days after BM cell transfer, their changes in body weight were determined between days 33 and 54, and serum IFN-γ level was determined 54 days after BM cell transfer. These values are also plotted (group III*). Each circle represents a mouse and black squares represent mean values. The significance of differences between Ab-treated chimeras and PBS-treated chimeras was assessed using Student’s unpaired t test. *, p < 0.05; **, p < 0.01; ***, p < 0.001 (B and C). D, Lymph nodes and spleens of chimeras were recovered, pooled, and used to prepare single-cell suspensions. CD44 fluorescence histogram of CD4−CD8α+ TCRβhigh cells from chimeras 40 days after BM cell transfer (54 days post-BM cell transfer for group III chimeras (group III*)) (bold line) are compared with the CD44 fluorescence histogram of control peripheral CD8+ T cells from C57BL/6 mice (plain line). Each histogram was generated with the data from one mouse but is representative of two individual experiments with five mice per group. In this study, we investigated the behavior of mouse chimeras (IIKO-B6 chimeras) lacking functional regulatory Foxp3+ T cells. These mice were not viable and rapidly developed systemic autoimmunity, with multiple organs being targeted by their own CD8+ T lymphocytes. 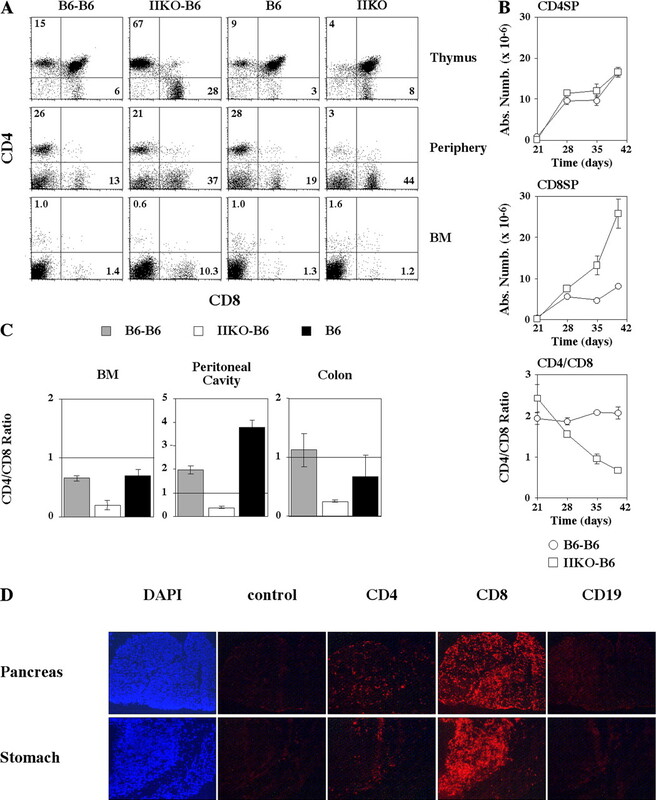 The elimination of peripheral CD8+ T cells (by anti-CD8 Ab treatment) was sufficient to cure this pathological condition in IIKO-B6 chimeras, demonstrating the major role played by CD8+ T lymphocytes in its development. The disease developed by IIKO-B6 chimeras was not due to the breakdown of CD4+ T cell tolerance, resulting in excessive CD4+ T cell help, as peripheral CD4+ T cells showed no sign of activation in our system, and very few CD4+ T cells were found in the various infiltrated tissues analyzed. Thus, even in the absence of CD4+ T cell help, CD8+ T cells were activated against self-Ags and mediated the massive release of inflammatory cytokines and tissue destruction, together leading to the death of the mouse. The pathological condition developed by IIKO-B6 chimeras differed from that developed by scurfy mice or IPEX humans in several respects (36, 37, 38). 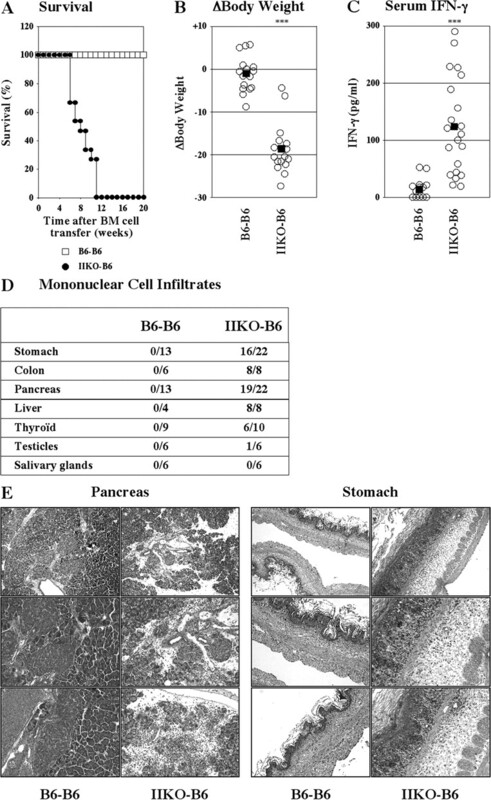 The endocrine pancreas was not affected and RBC numbers remained normal in IIKO-B6 chimeras (Fig. 3⇑ and data not shown). The activation of anti-self Ag effector CD4+ T cells in scurfy mice and IPEX humans, but not in IIKO-B6 chimeras, may account for these differences. However, it should be noted that whereas most studies on scurfy mice have concluded that CD4+ T cells are the main effectors of the disease (23, 24), our data show that CD8+ T lymphocytes are also affected by regulatory T cell deprivation and are certainly involved in the development of most of the symptoms observed in experimental mouse models with regulatory T cell deficiency. The mechanisms by which regulatory CD4+ T cells affect CD8+ T cell tolerance are unknown, but our work provides some clues. First, the establishment of CD8+ T cell tolerance to self by regulatory CD4+ T cells is set up in the periphery. Indeed, the treatment of control B6-B6 chimeras with anti-CD4 Ab leads to the development, in these mice, of pathological symptoms identical to those of IIKO-B6 chimeras. However, this treatment does not affect thymic development and both potentially pathogenic CD8+ T cells and fully functional regulatory CD4+ T cells (as MHC class II molecules were expressed on the surface of APC in these chimeras, regardless of their origin) were present in the thymus. Thus, CD8+ T cell tolerance depends on the suppressive activity of CD4+ T cells in the periphery. Second, regulatory CD4+ T cells are required only during a defined time frame in the constitution of the peripheral T cell pool for the establishment of peripheral CD8+ T cell tolerance. Indeed, whereas B6-B6 chimeras treated with anti-CD4 or anti-CD25 Abs during the first 2 wk of emigration of mature T cells from the thymus to the periphery rapidly developed pathological symptoms, Ab treatments given later had no effect. Thus, regulatory CD4+ T cells seem to be required to establish CD8+ T cell tolerance in the periphery rather than to maintain it. These results are consistent with our secondary transfer experiments showing that purified CD8+ T cells from adult C57BL/6 mice did not cause disease when transferred to lymphopenic recipients. Interestingly, CD8+ T cells from B6-B6 chimeras purified 4 wk after BM cell transfer induced the development of some, but not all of the symptoms of IIKO-B6 chimeras (pancreatitis but not gastritis) in secondary recipients, suggesting that CD8+ T cell tolerance had not yet been fully established in B6-B6 chimeras at this time point. Thus, once rendered tolerant, CD8+ T cells do not revert to pathogenic autoreactive effector T cells if transferred into a lymphopenic environment in the absence of regulatory CD4+ T cells. By contrast, adult CD4+ T cells have been shown to induce inflammatory bowel disease, gastritis, and other organ-specific diseases when injected into lymphopenic recipients in the absence of regulatory CD4+CD25+ T cells (16, 39). Furthermore, two recent studies have clearly shown that, to prevent catastrophic autoimmunity, regulatory CD4+ T cells control self-reactive CD4+ T cells throughout the lifespan of mice (40, 41). All these results put together strongly suggests that regulatory CD4+ T cells actively suppress effector CD4+ T cell functions as long as the two subsets remain in close proximity (42). Thus, the mechanisms by which regulatory CD4+ T cells induce peripheral CD4+ and CD8+ T cell tolerance are different. In summary, we demonstrate here a direct role for regulatory CD4+ T cells in the prevention of peripheral CD8+ T cell-mediated autoimmunity. We thank Sabine Colnot, Cécile Godard, and Isabelle Tardivel for invaluable help with histology, and Bernard Malissen for critical reading of the manuscript. ↵1 This work was supported by a grant from the French Research Ministry, a grant from the Fondation pour la Recherche Médicale, and by a grant for young investigators from the French National Research Agency. B.M. was supported by a Ph.D fellowship from the Fondation pour la Recherche Médicale. ↵3 Abbreviations used in this paper: BM, bone marrow; IEL, intraepithelial lymphocyte; IPEX, immune dysregulatory, polyendocrinopathy, enteropathy, X-linked. Shevach, E. M.. 2002. CD4+ CD25+ suppressor T cells: more questions than answers. Nat. Rev. Immunol. 2: 389-400. Shevach, E. M.. 2000. Regulatory T cells in autoimmmunity. Annu. Rev. Immunol. 18: 423-449. Sakaguchi, S.. 2000. Animal models of autoimmunity and their relevance to human diseases. Curr. Opin. Immunol. 12: 684-690. Roncarolo, M. G., M. K. Levings. 2000. The role of different subsets of T regulatory cells in controlling autoimmunity. Curr. Opin. Immunol. 12: 676-683. Piccirillo, C. A., E. M. Shevach. 2001. Cutting edge: control of CD8+ T cell activation by CD4+CD25+ immunoregulatory cells. J. Immunol. 167: 1137-1140. Shevach, E. M., R. S. McHugh, C. A. Piccirillo, A. M. Thornton. 2001. Control of T-cell activation by CD4+ CD25+ suppressor T cells. Immunol. Rev. 182: 58-67. Barthlott, T., H. Moncrieffe, M. Veldhoen, C. J. Atkins, J. Christensen, A. O'Garra, B. Stockinger. 2005. CD25+ CD4+ T cells compete with naive CD4+ T cells for IL-2 and exploit it for the induction of IL-10 production. Int. Immunol. 17: 279-288. Kojima, A., R. T. Prehn. 1981. Genetic susceptibility to post-thymectomy autoimmune diseases in mice. Immunogenetics 14: 15-27. Powrie, F., M. W. Leach, S. Mauze, L. B. Caddle, R. L. Coffman. 1993. Phenotypically distinct subsets of CD4+ T cells induce or protect from chronic intestinal inflammation in C. B-17 scid mice. Int. Immunol. 5: 1461-1471. Sakaguchi, S., N. Sakaguchi, J. Shimizu, S. Yamazaki, T. Sakihama, M. Itoh, Y. Kuniyasu, T. Nomura, M. Toda, T. Takahashi. 2001. Immunologic tolerance maintained by CD25+ CD4+ regulatory T cells: their common role in controlling autoimmunity, tumor immunity, and transplantation tolerance. Immunol. Rev. 182: 18-32. Asano, M., M. Toda, N. Sakaguchi, S. Sakaguchi. 1996. Autoimmune disease as a consequence of developmental abnormality of a T cell subpopulation. J. Exp. Med. 184: 387-396. Suri-Payer, E., A. Z. Amar, A. M. Thornton, E. M. Shevach. 1998. CD4+CD25+ T cells inhibit both the induction and effector function of autoreactive T cells and represent a unique lineage of immunoregulatory cells. J. Immunol. 160: 1212-1218. Mason, D., F. Powrie. 1998. Control of immune pathology by regulatory T cells. Curr. Opin. Immunol. 10: 649-655. Wildin, R. S., F. Ramsdell, J. Peake, F. Faravelli, J. L. Casanova, N. Buist, E. Levy-Lahad, M. Mazzella, O. Goulet, L. Perroni, et al 2001. X-linked neonatal diabetes mellitus, enteropathy and endocrinopathy syndrome is the human equivalent of mouse scurfy. Nat. Genet. 27: 18-20. Bennett, C. L., J. Christie, F. Ramsdell, M. E. Brunkow, P. J. Ferguson, L. Whitesell, T. E. Kelly, F. T. Saulsbury, P. F. Chance, H. D. Ochs. 2001. The immune dysregulation, polyendocrinopathy, enteropathy, X-linked syndrome (IPEX) is caused by mutations of FOXP3. Nat. Genet. 27: 20-21. Godfrey, V. L., B. T. Rouse, J. E. Wilkinson. 1994. Transplantation of T cell-mediated, lymphoreticular disease from the scurfy (sf) mouse. Am. J. Pathol. 145: 281-286. Blair, P. J., S. J. Bultman, J. C. Haas, B. T. Rouse, J. E. Wilkinson, V. L. Godfrey. 1994. CD4+CD8 −T cells are the effector cells in disease pathogenesis in the scurfy (sf) mouse. J. Immunol. 153: 3764-3774. Madsen, L., N. Labrecque, J. Engberg, A. Dierich, A. Svejgaard, C. Benoist, D. Mathis, L. Fugger. 1999. Mice lacking all conventional MHC class II genes. Proc. Natl. Acad. Sci. USA 96: 10338-10343. Bienvenu, B., B. Martin, C. Auffray, C. Cordier, C. Bécourt, B. Lucas. 2005. Peripheral CD8+CD25+ T lymphocytes from MHC class II-deficient mice exhibit regulatory activity. J. Immunol. 175: 246-253. Bourgeois, C., H. Veiga-Fernandes, A. M. Joret, B. Rocha, C. Tanchot. 2002. CD8 lethargy in the absence of CD4 help. Eur. J. Immunol. 32: 2199-2207. Williams, M. A., B. J. Holmes, J. C. Sun, M. J. Bevan. 2006. Developing and maintaining protective CD8+ memory T cells. Immunol. Rev. 211: 146-153. Malissen, M., A. Gillet, L. Ardouin, G. Bouvier, J. Trucy, P. Ferrier, E. Vivier, B. Malissen. 1995. Altered T cell development in mice with a targeted mutation of the CD3-ε gene. EMBO J. 14: 4641-4650. Martin, B., C. Bécourt, B. Bienvenu, B. Lucas. 2006. Self-recognition is crucial for maintaining the peripheral CD4+ T-cell pool in a nonlymphopenic environment. Blood 108: 270-277. Lambolez, F., O. Azogui, A. M. Joret, C. Garcia, H. von Boehmer, J. Di Santo, S. Ezine, B. Rocha. 2002. Characterization of T cell differentiation in the murine gut. J. Exp. Med. 195: 437-449. Van Meerwijk, J. P. M., S. Marguerat, R. K. Lees, R. N. Germain, B. J. Fowlkes, H. R. MacDonald. 1997. Quantitative impact of clonal deletion on the T cell repertoire. J. Exp. Med. 185: 377-383. Lyon, M. F., J. Peters, P. H. Glenister, S. Ball, E. Wright. 1990. The scurfy mouse mutant has previously unrecognized hematological abnormalities and resembles Wiskott-Aldrich syndrome. Proc. Natl. Acad. Sci. USA 87: 2433-2437. Godfrey, V. L., J. E. Wilkinson, L. B. Russell. 1991. X-linked lymphoreticular disease in the scurfy (sf) mutant mouse. Am. J. Pathol. 138: 1379-1387. Wildin, R. S., S. Smyk-Pearson, A. H. Filipovich. 2002. Clinical and molecular features of the immunodysregulation, polyendocrinopathy, enteropathy, X-linked (IPEX) syndrome. J. Med. Genet. 39: 537-545. Singh, B., S. Read, C. Asseman, V. Malmstrom, C. Mottet, L. A. Stephens, R. Stepankova, H. Tlaskalova, F. Powrie. 2001. Control of intestinal inflammation by regulatory T cells. Immunol. Rev. 182: 190-200. Lahl, K., C. Loddenkemper, C. Drouin, J. Freyer, J. Arnason, G. Eberl, A. Hamann, H. Wagner, J. Huehn, T. Sparwasser. 2007. Selective depletion of Foxp3+ regulatory T cells induces a scurfy-like disease. J. Exp. Med. 204: 57-63. Kim, J. M., J. P. Rasmussen, A. Y. Rudensky. 2007. Regulatory T cells prevent catastrophic autoimmunity throughout the lifespan of mice. Nat. Immunol. 8: 191-197. Martin, B., A. Banz, B. Bienvenu, C. Cordier, N. Dautigny, C. Bécourt, B. Lucas. 2004. Suppression of CD4+ T lymphocyte effector functions by CD4+CD25+ cells in vivo. J. Immunol. 172: 3391-3398.